I believe everything is connected. This is why I was so taken with Carl Jung when I was young. Almost no coincidence surprises me for long, since deep down I do not believe in coincidence. So wandering around Bayonne mourning Roy Scheider I was startled at first to find a connection in Bayonne to Steven Spielberg's classic film, Jaws, yet not completely surprised. Since Scheider, Robert Shaw and Richard Dreyfus were on my mind that dreary rainy day. The news of Scheider's death had hit me harder than I ever expected. Scheider not Shaw or Dreyfus connected with me the first time I saw Jaws - this despite the fact that I went in looking for Dreyfus since his character in American Graffiti had brought back memories of my uncle's teen gang growing up. Born in 1951, I had ached for Uncle Ted's life so well depicted in the Lucas film: my uncle's friend's Jimmy McNamara and Nicky Fraulo were the older brothers of my childhood friends. We fully expected to grow up being just like them and the culture changed, and I ached for what I didn't have. In truth, it wasn't Schneider so much as his character that bowed me over, since this character was endowed with all the self doubt I had growing up. He was powerful, but flawed, yet somehow had to overcome his own weaknesses in order to win out. When I'm upset, I walk. And as often enough, I wander around in a cold drizzle which fits my mood. Hearing of Scheider's death made me feel as if a part of me had tied, even though I knew almost nothing about the man. 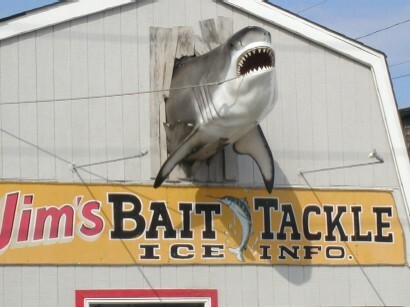 I saw him in other films of course, but in Jaws, he became a symbol of my own struggles with life, especially in the 1970s when I felt lost in a sea of my own manhood. At the time (and perhaps still) I felt fundamentally flawed and I saw a glimpse of salvation in Scheider's character, who seemed to reflect the conflicting demands of society I often felt. While I was not caught between the capitalistic urges of an ignorant mayor and a sheriff's fundamental duty to protect his citizens, I often felt at odds with my need to survive and my passion to create. Each time I gave into the practical, I always ached for something more. The 1970s were confusing years because my world demanded a lot of things from me. I ached to continue my role as father when I could not. I ached for romantic involvement and feared of repeating the bad romances of my past. Scheider's character became a kind of life preserver each time I viewed Jaws. Unlike most people, Jaws was never an empty summer block buster to be chewed like bubble gum and spit out when the flavor diminished. For me, the flavor never diminished, and Scheider was part of the reason. 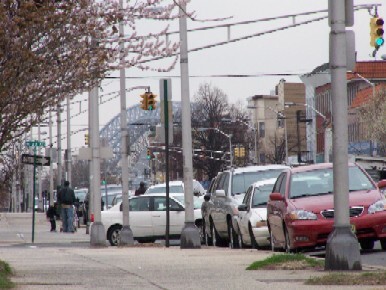 So thinking these thoughts I walked the streets of Bayonne, pausing momentarily not at the Bayonne Bridge Spielberg had made such a monument in his War of the Worlds, but uptown more, yet still within sight of the bridge. 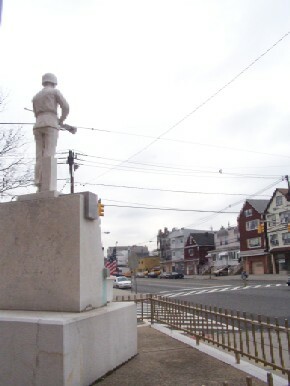 On a corner about 20 blocks away from where Spielberg filmed War of the Worlds, stood a statute of a World War II GI painted white, beneath which were the names of those Bayonne soldiers who had perished. 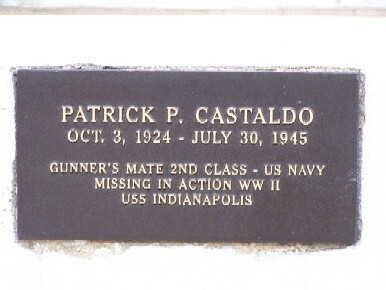 But beneath this was yet another plaque bearing one name of Patrick P. Castaldo - born Oct. 3, 1924, died July 30, 1945. At first, I thought how tragic it was that the man had died so shortly before the conclusion of the war. 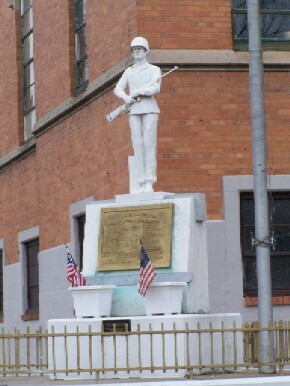 Castaldo had been a gunners mate 2nd class and was listed missing in action after his ship, the USS Indianapolis sank. His ship had delivered the bomb that had helped end the war, then was struck by Japanese torpedoes. His was the story the Shaw character told of 1,000 men going into the water and 800 being taken by sharks. 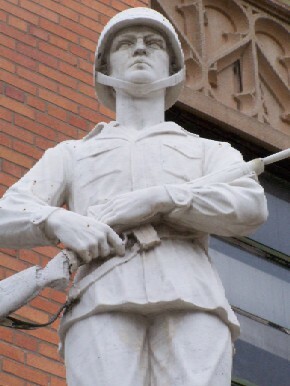 Spielberg probably never saw the statue or if he did, never stopped long enough to read it. But people from DreamWorks had passed it frequently during their trips around town to purchase supplies and props. This would have been the route they needed to take to get to Irwin's that first day when all of the staff needed umbrellas in order to gather and talk in the yard at the center of War of the Worlds. The prop people would have rushed by here as well to go to John's Natural Foods for props as well. Standing there in the rain, mourning a fictional character, I suddenly understood this connection in time and place, and felt perhaps that my mourning wasn't wasted on fiction, but connected in some way to greater things in the universe, giving fiction even greater meaning as it reinvents our lives.